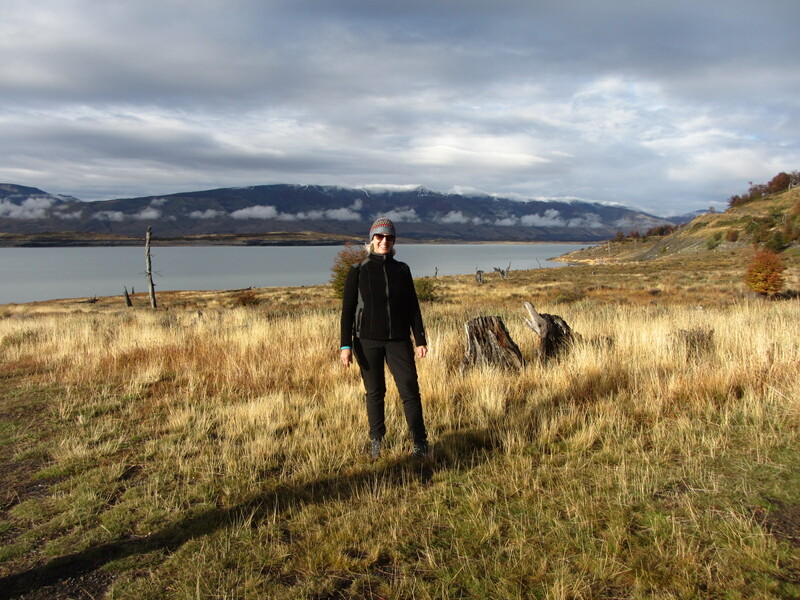 Earlier this week I crossed the Chilean border into Argentina and have spent the past few days exploring El Calafate, a beautiful Patagonian town. The town is surrounded by groves of towering alum cypress trees turning a stunning autumn yellow. 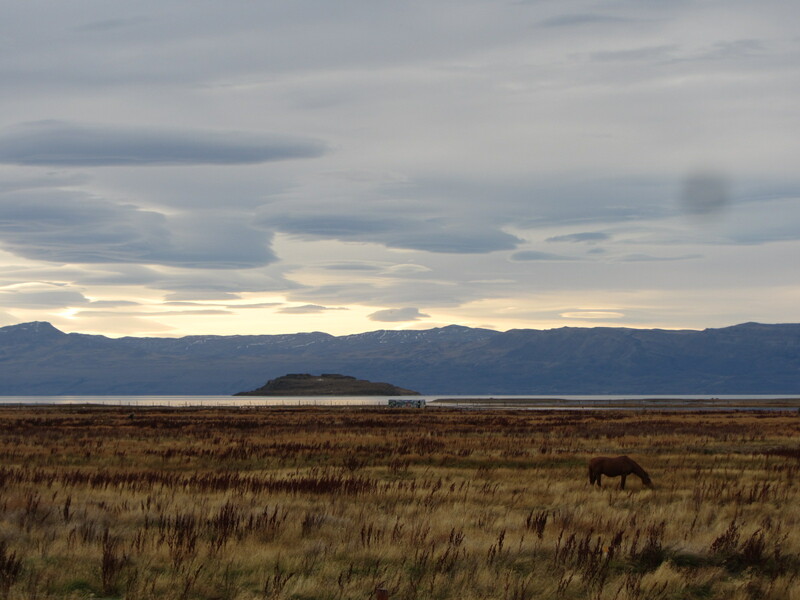 El Calafate was named after Patagonia’s indigenous calafate bush. 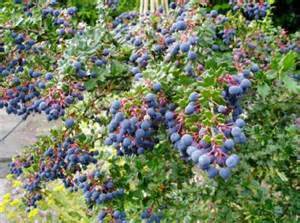 They say if you eat calafate berries, you’re guaranteed to return to Patagonia. El Calafate is one of the world’s most popular trekking and hiking locations and known as the “capital of the glaciers”. 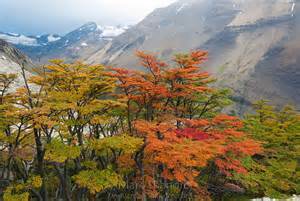 It’s a few miles from the National Park Los Glaciares which was given a ‘World Patrimony of Humanity‘ declaration by the United Nations. The Park covers almost 2,000 square miles with stunning glaciers descending into lakes Viedma and Argentino. El Calafate has its share of high-end hotels, lodges, shops, and restaurants catering year round to tourists from all over the world. There are some impressive artisan shops in the main part of town. I found a reasonably priced accommodation and a fantastic restaurant – Isabel. It’s named after a famous and provocative Argentinian actress, Isabel Sarli. During parts of this long trip it’s been difficult finding food I like, so discovering Isabel was a treat. 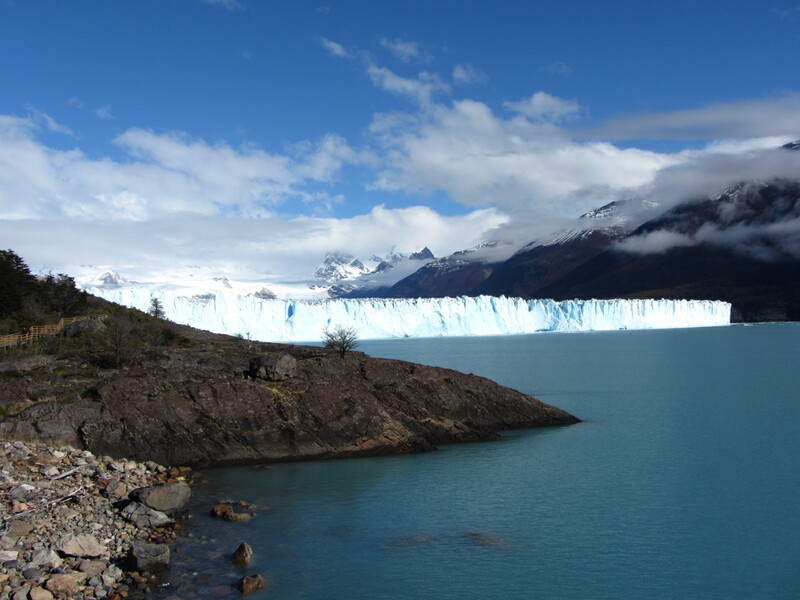 The glaciers in the Park are all magnificent but Perito Moreno is especially fascinating. It’s a wall of ice over 200 vertical feet high – roughly the size of a 15-story building! The glacier is 3 miles wide and 19 miles long! It descends from the Southern Patagonian Ice field in the Andes Mountains down into the water and warmer altitudes of Lago Argentino. Perito Moreno is a UNESCO World Heritage site. Nearby on the north arm of Lake Argentino you can see Perito Moreno’s fellow glaciers, Upsala, Onelli, and Spegazzini. Glaciers make cracking ice sounds 24 hours a day and when a front wall falls down, it’s supposed to be an unforgettable sight and sound! The colors and shapes of massive chunks of ice floating in Lake Argentino are an amazing sight. 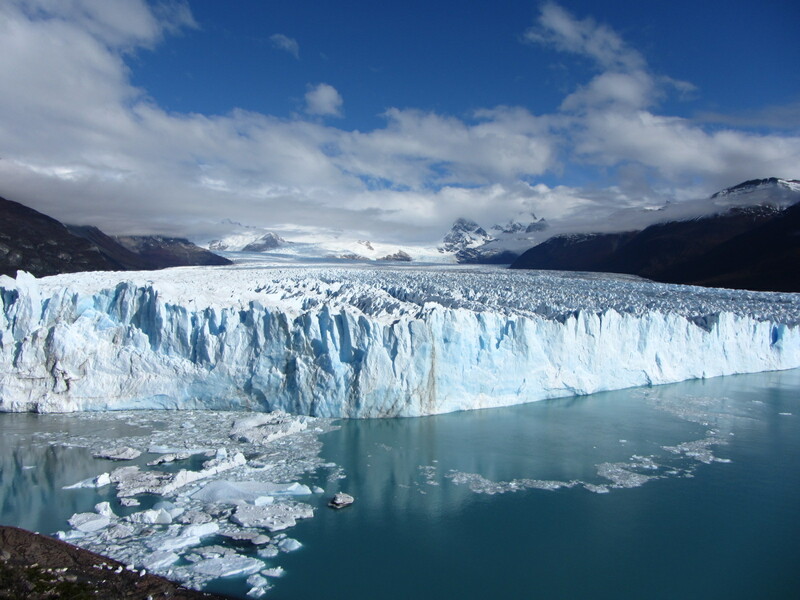 Perito Moreno is famous for periodically cutting off the major southern arm (known as Brazo Rico) of Lake Argentino. It advances across the lake to the opposite shoreline. As an “advancing glacier” Perito Moreno is constantly changing, swelling, and growing – rather than receding – at a rate of up to 7 feet a day. There are various ways to get close to Perito Moreno. I considered an ‘ice trekking’ tour walking inside Perito Moreno but decided to just spend the day hiking near the glacier. The hiking trail around the glacier is thoughtfully designed and gives you the opportunity to see Perito Moreno at eye level as well as from above and below. Hiking trails also extend into forested areas beyond the glacier where you can see indigenous plants and dominant species such as southern beech and lenga trees. In autumn, the lenga trees turn a gorgeous deep crimson color filling the mountains with brilliant splotches of red. Perito Moreno is one of the most beautiful natural wonders I’ve ever seen! The constant sound of the ice cracking and moving is eerie and definitely gets your attention. It sounds a bit like distance gunshots. I was hoping an ice wall would break apart during my hike – didn’t happen – but a large fractured piece of ice fell off into the water. Watching it fall was exciting! The force of falling chunks of ice and the pieces that get thrust into the air can be dangerous. One sign posted near the glacier says that from 1966 to 1988, 32 visitors standing too close when a chunk of the glacier fell off died from injuries after being hit by air-borne pieces of ice. I imagine there have been many visitor accidents caused by people who do not respect the glacier and get too close. Rangers patrol the hiking path reminding visitors to stay on the trail. During the hike I noticed two bold photographs (they looked like professionals) getting very close to the glacier for some amazing shots. At the end of the day as I was hiking back to the main lodge I saw rangers escorting the photographers out of the park. Not sure exactly what they did but obviously they broke the rules. Tomorrow I leave for a few days in nearby El Chaltén, a town popular with trekkers, climbers, mountaineers, and mountain lovers who come to the Andes. 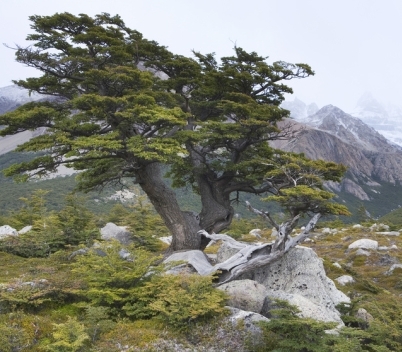 This entry was posted in Argentina, South America and tagged Alum Trees, Brazo Rico, Calafate Bush, El Calafate, El Chalten, Isabel Restaurant El Calafate, Laguna Nimez El Calafate, Lake Argentino, Lake Viedma, Lenga Trees, Najo las Sombras, National Park Loa Glaciares, Onelli Glacier, Patagonia, Patagonian Cypress Tree, Patagonian Southern Beech Tree, Perito Moreno, Rico Arm, Southern Beech Tree, Spegazzini Glacier, UNESCO Sites, Upsala Glacier, Viedma Lake by suemtravels. Bookmark the permalink. Impressive and amazed that glaciers can be so noisy.